Many of Oregon's volcanoes live in the Cascades. 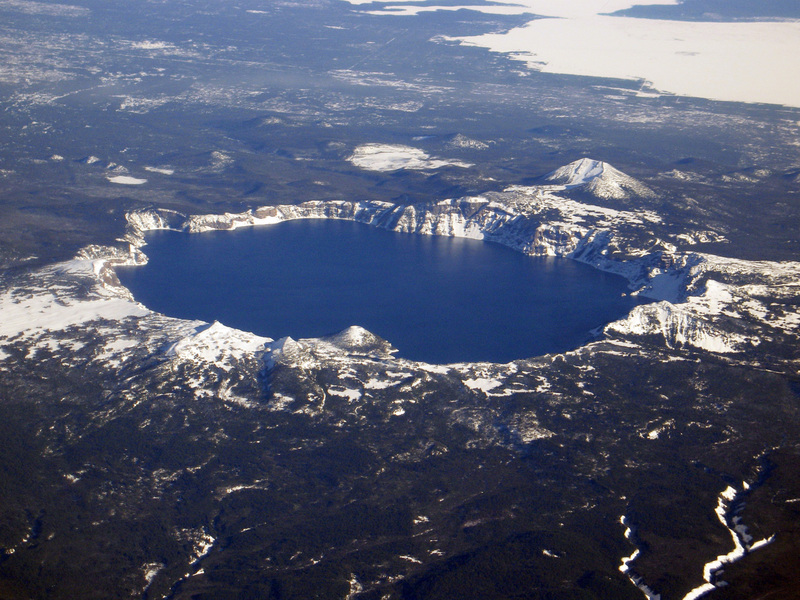 Crater Lake, the exploded remnant of Mt. Mazama, supplies an excellent opportunity to view and study many aspects of volcanic processes. Join us for a detailed look at the formation and continuing evolution of this volcanic wonder. The course features a 3-day trip to the area for hands-on, real world observations of volcanic processes and materials. Description: GS170-MM will take a detailed look at the volcanic materials and processes of Mount Mazama (Crater Lake) and the surrounding volcanic field. The course includes a 3-day field trip to the area for a detailed and hands-on examination of the region. Objectives: The purpose of this course is to familiarize the student with the unique geology and volcanic landforms in the upper Rogue River basin. Information on plate tectonics, petrology, hydrology, and stream processes will be supplied at orientation, as well as during the trip itself. Length: 5 days, consisting of 1 day of orientation, 3 days in the upper Rogue and Crater Lake, and a day at the end to share and turn-in projects. Orientation will be held at the Redwood campus on Friday, July 13, 2018, from 8:00 am to mid-afternoon. We will meet at Dodge Bridge on Friday, July 20 at 9:00 am to begin the three-day field experience.The fifth session is scheduled for Friday, August 17, 2018 to share and turn in projects. Travel: By personal vehicle. Drivers will need to provide proof of insurance at orientation. Logistics: We will meet at Dodge Bridge on Friday, July 20, 2018 at 9:00 am. Students will drive their own vehicles; however, carpooling is encouraged and recommended. The class will meet daily from 8:00 am to approximately 5:00 pm. Students will be responsible for their own transportation, meals, and lodging. The field portion of the course will end on Sunday afternoon (July 22) at approximately 4:00 pm. A follow-up session on Friday, August 17 is planned to share and turn in projects. Camping: Please note that campsites are limited in the upper Rogue and Crater Lake areas, and there is traditionally quite a bit of competition for any available sites. Some campgrounds (but not all) allow reservations, and it is strongly suggested that you reserve early. Prerequisites: None; however, several of the day hikes may be considered moderate to challenging (especially the treks to Union Creek Falls and the Watchman). It is recommended that the student be in relatively good shape if (s)he wishes to join in these experiences, and that they bring along comfortable hiking shoes or boots. Please note: the ability to complete the hikes is not mandatory to earn a passing grade; however, they are strongly recommended if the student wants to gain the full benefit of the course. Materials: Various handouts, and topographic and geologic maps of the region. The student is encouraged to research on-line for supplemental information prior to orientation. Fees: In addition to tuition, a travel fee of $25 per student will be collected at registration. The student will also need additional funds during the field portion of the course for gas, food, and lodging.